The Legislation for the control and marking of articles of precious metals ratified by the House of Representatives in 1991, establishing a legal entity, the Cyprus Organization of marking of articles of precious metals, (the Cyprus Assay Office -CAO). The CAO is governed by a Board of Governors, appointed by the Council of Ministers, and consists of 11 members representing Government Departments the Trade and the Consumers. The compulsory hallmark of all articles of precious metals (Gold or Silver) offered for sale. Exemptions from hallmarking apply to gold articles with weight less than 1 gr and silver less than 3 grs. Omission to conform to the above constitutes a legal offence, with punishment a fine not exceeding ? 10,000 or to a term of imprisonment not exceeding two years or both. 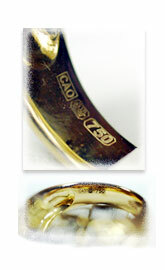 Describing articles as gold or silver is allowed only if these are hallmarked with the approved marks of CAO. Otherwisethisactionisillegal. Hallmarking of articles made partly of Gold or Silver and a non precious metal part (e.g bronze, stainless steel, etc) is allowed, provided that the non precious metal part is distinguished by colour and there is enough place to mark the indication “MET” or “METAL” on it by the CAO. The Cyprus Organization for marking of articles of precious metals Law, (N.52/2009) is in force. Also from January 2nd 2013, comes into force an amendment Law (N.139(I)/2021) regulating the trade of second-hand articles. The new consolidated Legislation abolishes all previous Laws relative with the CAO (N.179(Ι)/1991, Ν.13(Ι)/1998, Ν.46(Ι)/2000, Ν.139(Ι)/2000 and Ν.115(Ι)/2006)).